I'm making money in the middle of the night.. The best way to curse??? Fan sounds like pants meh?? What????!! My daughter is not my daughter????? Thanx to Lil' Ms Pinky!! Are you normal or nuts?? Like that also can kah?? Hubby's new wife is just sooooo beautiful. I'm your best friend, am I?? This photo was taken last month actually..I always forgot to post it. See my son..he is not even scared with the real snake. I thought he will scream when the snake slithered on his hand. But nope..he was sooo happy playing with the snake, while I was the one who screamed "Arghhhh!! eeeeeee!! yerrrrrrrr!! ehhhhhhhhhhh!!" seeing that ugly snake!!! Heheeee...thats about my 'before going back' post....I need to go to pasar malam to buy something! Just remember MIL asked me to buy lotus root for her soup..! Need to go off now, or else i will reach home very late..tata!! Isaac Isaac ko mimang lah starring!!!!!!! So sweet lar your hubby. Your daughter smiled so happily! Isaac, u da man! U so brave! choc mint girl ~ iya bah!!! sia pun takut sama tu ular..jauh2 sia dari si isaac masa tu..
lab papa ~ eeeeeeeee...nda lah sia mau p try!!! GELI!!!!!! lil' ms pinky ~ yes! life is indeed great when we married the right man..thats why i feel so blessed now..
kobie vanessa ~ :) Kiut kan dorang..Si isaac tu memang..ular nda takut sekali lipas takut pulak..
mell ~ sia lagi malu! hahaha anak nda taku..sekali si mama pulak penakut!! nature law ba tu mama....men always trying to be the hero/protector...so no matter what..men will always look macho but they were also weak inside...similar to women jg..when men get married..wife would worry if their man willing to ignore their arrogance and ego type of attitude in order to make the marriage beautiful..in most cases..once men get married, unfamiliar things would happen..funny things likely to happen all the time...then there were time when you see something that you would never expected from your man...that's the beauty of marriage.it actually changes the life of 2 cupids as well as the child in time to come...ego or ashamed...is not an option when you're married..great god you've made the right choice and I'm happy for you...cheers! adora madpie ~ sia pun kegelian tingu nie!!! 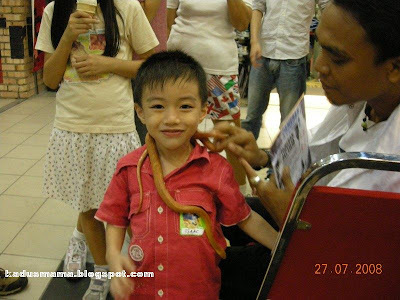 EEEEEEE..jejek tul tengok the snake..
kobie vanessa ~ macam ah hau kah?? :) ntah napa dia takut lipas tu..hehe mengkali juga nda kiut..
wel^beiolman ~ Marriage did change a person kan.. apa lagi kalau ada anak..from tough and macho guy, he can be very soft and loving to his kids..
Nick Phillips ~ hehehe! 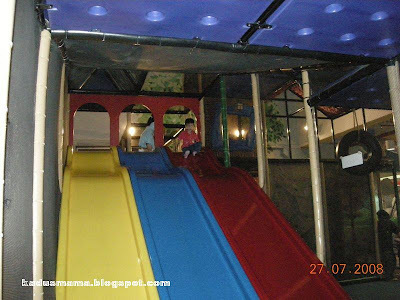 have you ever play a slide with your kids?? Ok..you can join me screaming now..ARGHHHHHHHH!!!!!!! mama mia ~ Hehehe..iya bah! suka betul dia bawa dorang main tu..
Next time ur hubby main juga bah tu..jan ko risau..
oukayyy...that little snake makes me squeamish....eeeeeewww! 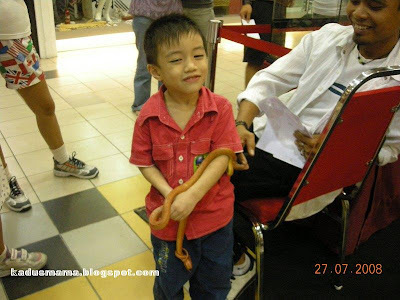 chegu carol ~ Eyeeeehhhhhhh kan tengok the small snake!! ular besar tidak berapa bikin geli..its the small one yang 'jejek' sekali!! hehehe but me, both also scared..kecil kah..besar ka..nda lah sia berani pigang!! I'm a KadazanDusun (Kadus) Mommy who married to a Handsome Chinese Guy :P. I'm so blessed to have a beautiful Babies, Isaac and Inesha Alexandra. All you need to know about me is, I LOVE MY FAMILY VERY MUCH. Come and chat with me..